This tropical, ginger-like in appearance rhizome dates back to 1500 B.C., and mentioned in the sacred scriptures of the Hindus. Considered an important spice in India and used as a cosmetic, a coloring agent and as traditional medicine for treating digestive complaints, colds and wounds. 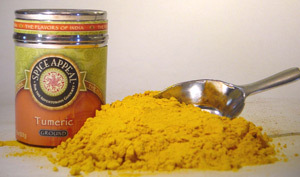 This bright yellow spice has a musky and earth aroma with a gingery, slightly bitter taste. An essential ingredient in all curry powders. Used in most Indian dishes to help digest the complex carbohydrates. Add to Indian and Southeast Asian curries, pickles, soups, lentils, potatoes, fried fish and pullaos. Add to deviled eggs, chicken stock, egg salads, relishes and spreads.